Dr Mackey is the founder and director of Adam's Back, a sports and family-based chiropractic healthcare centre in Rosebud, Victoria where he has enjoyed supporting the local community for over 20 years. 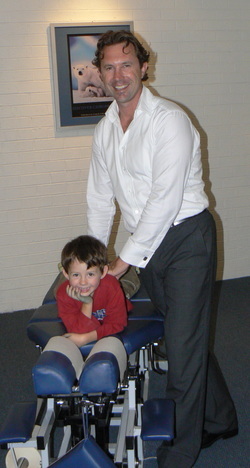 Dr Mackey became a chiropractor because it was Chiropractic care that helped him with his persistent sporting injuries. He has since been a consistent contributor to athletes around the world with his care. Early in his career, he worked in the UK with the Guildford Flames ice hockey team and later in Scotland for the rugby teams of Perthshire. In 1996, he travelled with the Australian Surf Lifesaving team to Durban in South Africa for the lifesaving world championships. He returned to Africa in 2000 to work in the medical village of the All African Games. He worked at the Uncle Toby’s Iron Man events in Victoria and at the Australian Lifesaving Championships for 5 years. He was the team chiropractor for Taekwondo Victoria and Taekwondo Australia for many years, travelling the country to provide chiropractic care at numerous international events including the Commonwealth Taekwondo Championships at Homebush. He is currently a clinician for the not-for-profit organisation Hands On Health Australia and he is a student mentor for RMIT. Dr. Ellie is passionate about helping people to achieve their goals and improve their wellbeing through Chiropractic. She loves caring for people in her local community and helping individuals to reach their full health potential. James is a Therapeutic Massage Therapist with many years of experience in the spa and wellness industry. His unique, holistic style combines therapeutic stretching, deep tissue work, myofascial (muscle) release and a nurturing, caring touch. Dr. Sussen Ibrahim-Dost, Chiropractor, BHSc/ BAppSc (DC) with Distinction, B.An.Vet.Bio.Sc. Dr. Sussen Ibrahim-Dost’s chiropractic journey began when she, her partner and her grandmother were quite ill. After going through many health professionals they finally stumbled upon a Chiropractor who helped heal them all. This experience shaped their lives for the better and inspired Dr Sussen to embark on her journey to become a chiropractor. The philosophy, art and science of Chiropractic fit perfectly with her personal mission statement. Dr Sussen’s academic achievements include a Bachelor of Animal Veterinary Bioscience majoring in Microbiology and Zoology at La Trobe University and a Double Bachelor of Health Science/Applied Science Chiropractic with Distinctions at RMIT Univerisity. She received two outstanding academic achievement awards in Chiropractic and was invited to become a Golden Key International Honour Society member due to academic achievement at RMIT. She enjoys continuing health research and studies to educate others in the best ways one can live an outstanding life with a fully functioning nervous system. Her special research interest is in discovering how our brain and nerves can function at optimum so we are able to self-heal, regulate and adapt to our evolving ever-changing environment. She has completed 250 hours of yoga teacher training. By integrating individualised chiropractic flows of movement, she helps her patients heal, restoring independence and confidence. These movements enhance function and prevent exacerbations of injuries in order to maintain health and vitality in a fun interactive way. In Dr. Sussen’s spare time you will find her running, reading and taking care of her beautiful dogs Ruby, Roxy and Raven. She has a special interest in natural human movement and a primal way of living. Her aim is to inspire people to become advocates and examples of proactive health care and to educate families in prevention to avoid need for cure.